It’s projected that nearly a billion hectares of terrestrial ecosystems will be lost by 2050 as land is converted into places to grow food and fibre, extract minerals and oil, or house people. Even with a first-rate protected area network, such losses of habitat mean that extinctions will continue (and likely accelerate). Is there a way to stem such losses in the face of inevitable development? Should all the cute and cuddly get the lion's share of conservation resources? 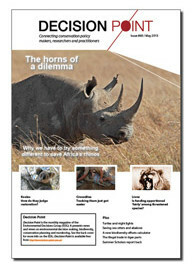 Is the most sensible way to conserve South Africa’s rhino through a carefully controlled legal trade in horn harvested from live animals?